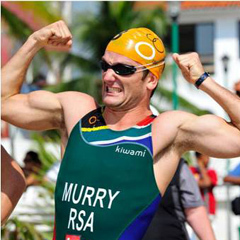 Hamburg - Richard Murray of South Africa won his first world series triathlon outsprinting two-time world champion Javier Gomez of Spain on Saturday. The sprint format - 750m swim, 20km bike, 5km run - made for a fast race, and Murray went all out on the run to see who could stay with him. Only Gomez could. They frequently swapped leads, but Murray eventually powered ahead and won by five seconds. Steffen Justus was third, another six seconds back, to lead home all three German Olympians in the top 10. The three medallists chased down a breakaway group of four on the first running lap and couldn't be caught. Last year's winner, Brad Kahlefeldt of Australia, was sixth. Defending Olympic champion Jan Frodeno of Germany was 10th.